What if I told you that you could be enjoying a warm piece of apple cake in less than an hour, right from your own oven? Would you believe me? More importantly, would you try it? I swear this cake is THAT easy. Heck, I’m willing to bet you have all the ingredients on hand too. OK maybe that’s stretching it, but then again, maybe not. My mom has been making this cake for decades, and it’s always been a family favorite. She thinks perhaps it came from the local paper, so I did some digging. I love when there’s a story. I need to know the history. But alas, no such luck. I figure with a name like “raw apple cake” there must be a story behind it. Why call it raw? Right? 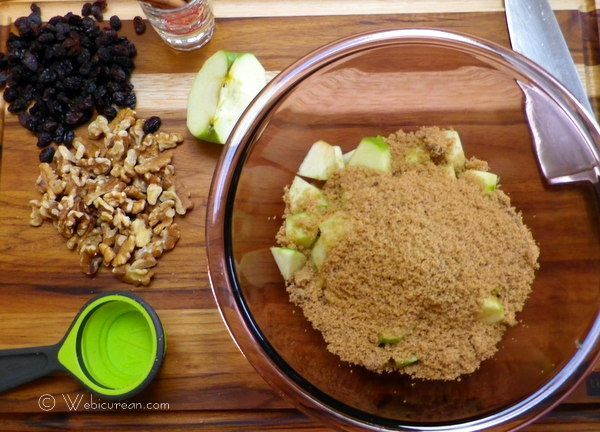 After all, when baking with apples, don’t you always start with a raw one? Ah well, the cake requires such little fuss to prepare, I probably shouldn’t fuss over such details so much either. When working with old recipes, I try to stay true to the original as much as possible. Personally, the recipe as written was a tad too sweet for me, so some adjustments were made. The recipe initially called for granulated sugar only, so I decided to go halfsies with brown.Â Honestly, if you wanted to cut the sugar, either by subbing in some applesauce or simply cutting back, I’m sure the cake won’t suffer. In fact, one of the things I love about this cake is that it’s so forgiving–say, for example, your oven is a little too hot, and it gets slightly over done. The apples keep it so moist, this is one cake you shouldn’t slightly undercook as it could end up soggy the next day, assuming it lasts that long. Google revealed quite a few variations of this cake which may be worth exploring some day. For me, the beauty of the Raw Apple Cake is its simplicity, so why create more work?Â Although personally I prefer taking it straight, the cake could also be drizzled with a salted caramel sauce or sidled up against a scoop of homemade vanilla ice cream for a more dramatic presentation. Either way, it’s sure to please. First, let’s gather up the ingredients. 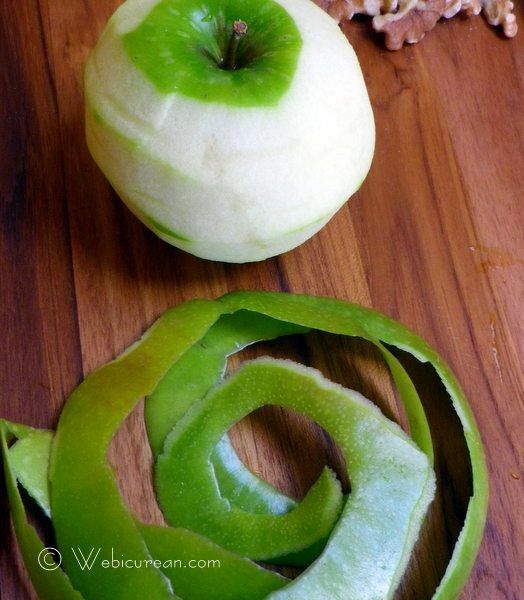 I used a Granny Smith apple, but Gravensteins work just as well. This cake is very sweet, so the apple should be tart for better balance. The apple needs to be peeled and chopped. Let’s get that out of the way first, as the rest goes pretty quickly. Next, toss the apple with the sugars and the egg. This will get the apple’s juices flowing, which helps make the batter moist. 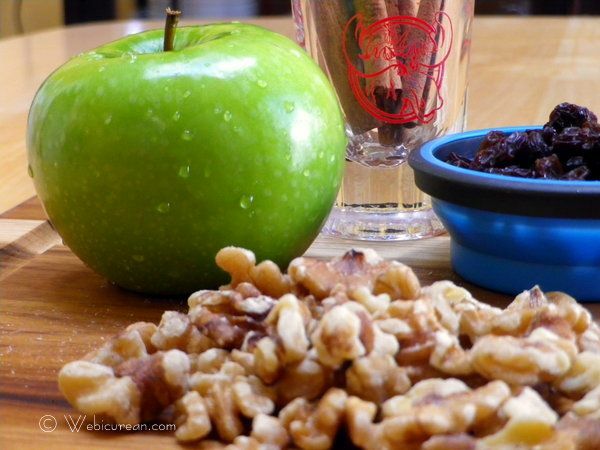 If you’re using nuts and/or raisins, which are totally optional, let’s toss them in now. The cinnamon, nutmeg, vanilla, and oil should be added at this point too. Give it a good stir. Now we can add the dry stuff. If you like to do things the “right” way, you can sift together the flour, salt & baking soda before adding. If you’re like me (ie, on the lazy side), those items go straight to the bowl, sans sifting, where you can give them a good tumble until no dry remnants remain. This all gets spread into an 8″ pan and popped into the oven. That’s it. Bake until golden brown. Then let it cool, if you can stand it. The house should smell heavenly at this point. Go ahead. There’s still enough time for you to serve this tonight for dessert. 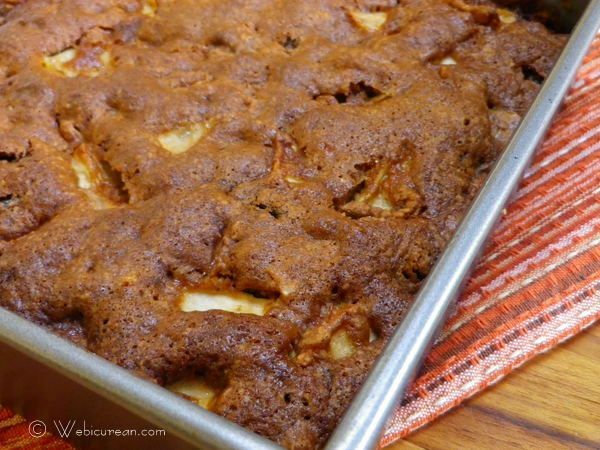 This apple cake is super easy to make and gets rave reviews every time. Grease and flour an 8" square baking pan. 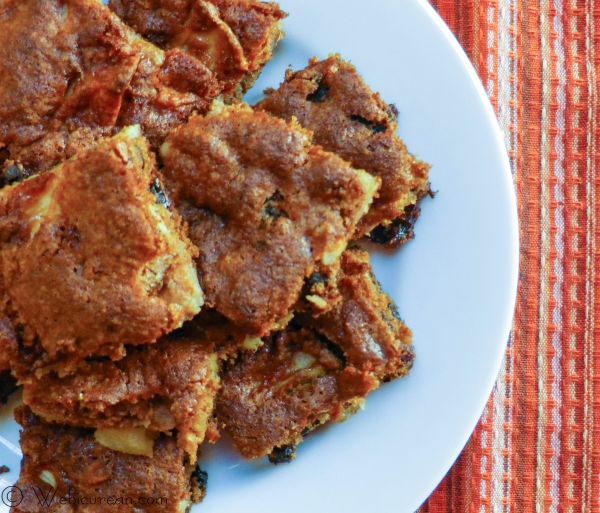 Combine apple, egg and sugars. Mix well. 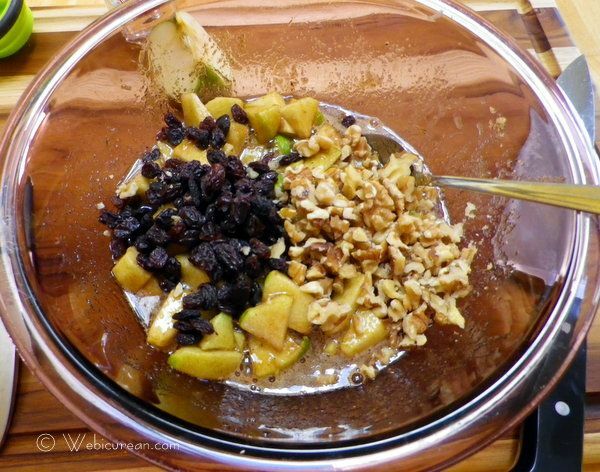 Stir in spices, vanilla and oil, along with raisins and nuts, if using. 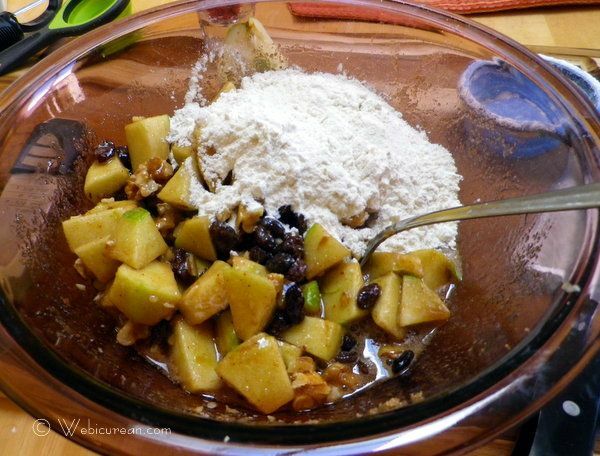 Sift together flour, salt and baking soda, then add to apple mixture. Stir until dry ingredients are completely moistened. Spread evenly in pan and bake 40-45 minutes until done. Stop by next Sunday for some homemade limoncello. Enjoy! Hello, The cake looks wonderful; it reminds me of a cake that I used to make in high school, but I used to bake it directly in a round tin cake box. I am interested in trying to make this cake, but I have a few questions. 1) Is it OK to substitute olive oil for the vegetable oil as I do not usually have vegetable oil on hand? 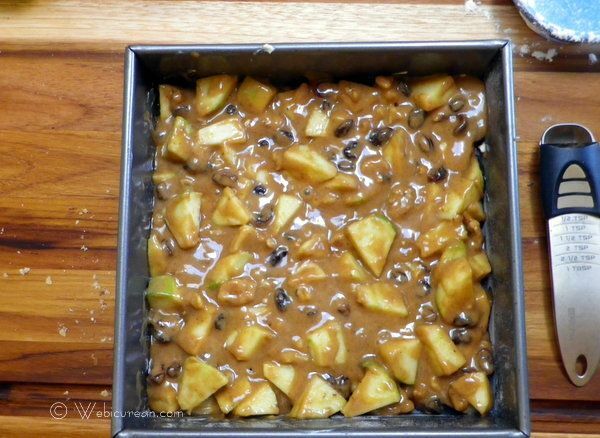 2) Must you add raisins to keep it moist or are the apples enough? 3) If you use a pyrex cake pan, do you need to change the temperature or the baking time? I love your mother’s apple cake. 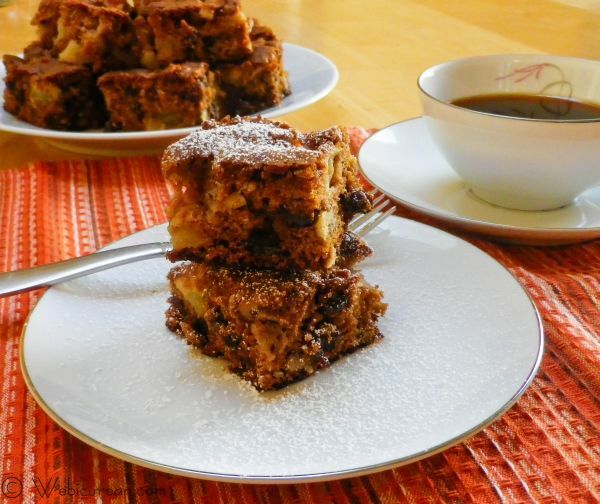 I have a similar recipe that calls it fresh apple cake but whatever the name, it’s delicious! Thanks! I noticed on some sites with variations, commenters were complaining about the “misleading” name, which is silly! You’re right, whatever you call it, it’s delicious! I made the cake yesterday and it turned out beautifully and was a big hit! That’s awesome–thanks for the follow up! Okay seriously this looks so good. It’s making me wish fall would hurry up. I rarely turn on my oven in the summer. But I must try this. And soon. I made your cake the other night, it was Die-licous. A big hit with mom and Tony. I’m going to make the Kale pesto sauce tonight, freeze it and enjoy it while camping. Woohooo!!!! That’s so awesome–I’m glad everyone enjoyed it! Thanks for coming back to tell me! Thanks! My mom has me making this all the time for her–it’s amazing how easy and good it is. BTW I love your blog name–it sounds like a really tasty recipe itself! I woke up in the middle of the night and ate all the brownies my girlfriend made. She was not thrilled the next day without anything to munch on so I decided to try your recipe!! I tried a piece as soon as it came out of the oven and was a little disappointed as it was bland/flour like… But then almost magically, after letting it cool for a few hours, I had another piece and it tasted so good that even my six year old daughter (who gags at and refuses to eat anything but commercially processed food) thought it was delicious. Giving it some time to cool brought out the sweetness and cinnamon flavor I was hoping for. Thank you so much. Had to share as I’m sure I’m not the only person out there with a sweet tooth and a lack of ingredients!! p.s. I had no baking pan so used an 8×8 Pyrex. Baked at 320 F. in a conventional oven for 53 minutes. Somehow I missed your post–I’m so glad you enjoyed this! It’s one of our favorite treats here! 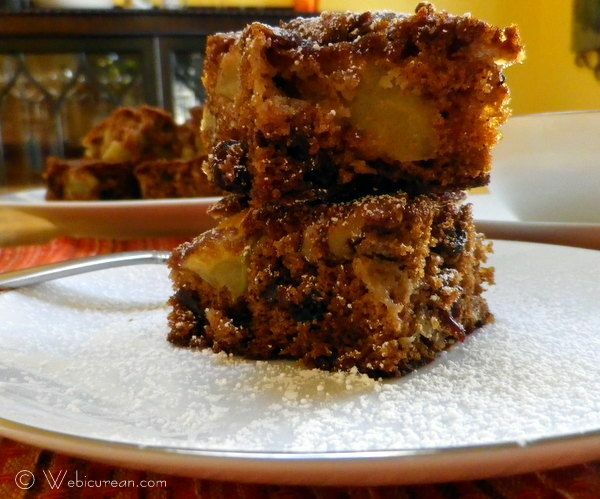 I have made Raw Apple Cake for years. My great grandmother had always made it when I was younger. It’s one of those things that’s so simple yet so delicious! Nice cake recipe. Thank you and Happy Thursday. Hi Mert! I’m glad it all worked out, and you were able to enjoy it! I was just looking over my mom’s notes, and she recommended baking an hour for a double recipe–however, when she doubled it, she cooked it in a 13×9 inch baking dish, which is probably why it required a little less time. Good to know with a few more minutes it can work in a bundt pan too. Thanks for letting me know! I love easy recipes like this. Made this today and love it, I used 2 different kinds of apples. Glad you enjoyed it! It’s so simple–it’s really an any time cake!